This article explains how to populate a child DropDownList depending on each new value as values are selected in the parent's DropDown List. This article explains how to populate a child dropdown list depending on each new value as values are selected in the parent's DropDown List. I use two tables to populate DropDown Lists. One is a Country table and another is State table. The Country table is a parent table and the State table is a child table. These tables have primary key and foreign key relationships using the CountryId column. Create a relationship between Country table and State table using foreign key. It is a one to many relationship where a single country has multiple states. First populate the parent dropdown list using the Country table then populate the child dropdown list using the State table by the selecting the CountryId from the parent dropdown list. I will create a MVC application using Visual Studio 2012. So let's see the procedure for creating a MVC application. Step 1: Go to "File" -> "New" -> "Project...". Step 2: Choose "ASP.NET MVC 4 Web Application" from the list then give the application name "CountryStateApplication" and set the path in the location input where you want to create the application. Step 3: Now choose the Project Template "Empty" and select "Razor" as the view engine from the dropdown list. 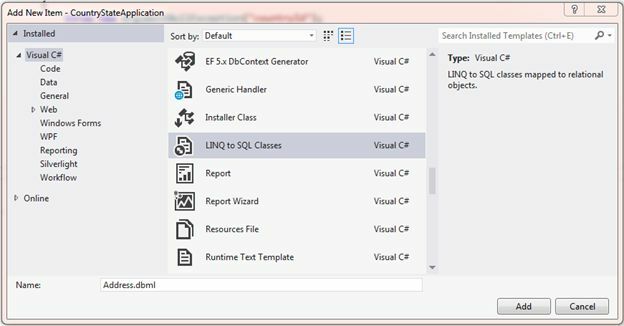 Step 1: Right-click on the Models folder in the Solution Explorer then go to "Add" and click on "Class.."
Step 2: Choose "LINQ to SQL Classes" from the list and give the name "Address" for the dbml name. After that click on "Add". 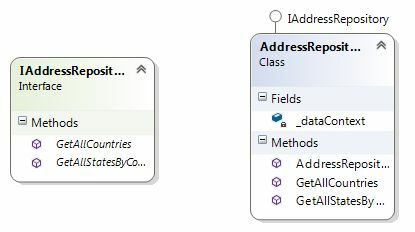 Step 3: Drag both tables (Country table and State table) from the database in the Server Explorer and drop onto the O/R Designer surface of the "Address.dbml" file. The Repository Pattern, according to Martin Fowler, is a repository that mediates between the domain and data mapping layers, acting like an in-memory domain object collection. Client objects construct query specifications declaratively and submit them to the repository for satisfaction. Objects can be added to and removed from the repository, since they can form a simple collection of objects, and the mapping code encapsulated by the repository will carry out the appropriate operations behind the scenes. Conceptually, a repository encapsulates the set of objects persisted in a data store and the operations performed over them, providing a more object-oriented view of the persistence layer. The repository also supports the objective of achieving a clean separation and one-way dependency between the domain and data mapping layers. In practice, it is usually a collection of data access services, grouped in a similar way to the domain model classes. I implement the Repository pattern by defining one repository class for both domain model entities that require specialized data access methods. A repository class contains the specialized data access methods required for its corresponding domain model entity. When you create the repository class, you create an interface that represents all of the methods used by the repository class. Within your controllers, you write your code against the interface instead of the repository. That way, you can implement the repository using various data access technologies in the future. So first of all you need to create an interface "IAddressRepository" under the Models folder that contains basic access methods for country and states by countryId. Thereafter create a repository class "AdderessRepository" that implements the "IAddressRepository" interface under the Models folder. The MVC Model contains all application logic (business logic, validation logic, and data access logic), except pure view and controller logic. Create a "AddressModel" class under the Models folder and create properties for label field and dropdown list values. You need to create a controller to handle request from the browser. In this application I created the "AddressController" controller under the Controllers folder with two action methods. One action method "Index" is used to display the view with countries data filled in in the country dropdown list by browser request and another action method "GetStatesByCountryId" is used to fill in the state dropdown list based on the selected country from the country dropdown list. You need to create a route to call action method of controller by ajax so add new route "GetStatesByCountryId" in RouteConfig class (RouteConfig.cs file) under App_Start folder. A view is used to display data in a browser. I created the "Index.cshtml" view to display data under the Address folder of the View folder. You need to add a reference for jQuery so you can use the ajax method of jQuery in the view. You need to call the change event of the country dropdown list method when a new country item is selected from the dropdown list. When an item selected from the dropdown then an ajax call is made, on success of the call of the action method the state dropdown list is filled with data.